Income tax in Australia is the most important revenue stream within the Australian taxation system. Income received by individuals is taxed at progressive tax rates in Australia. That means the more money you earn, the higher tax rate you pay on the extra income. For low income earners Australian Government has set a tax free threshold and as you can see from the tax tables below the tax free threshold has been increased significantly for the 2012-2013 Financial Year. Raising the tax free threshold to $18,200 will free up to a million people from having to lodge a tax return from 2012-13. This will make life easier for many low-income earners who currently have to interact with both the tax system through the Australian Taxation Office and the transfer system through Centrelink. In future, many of these people will only have to interact with the transfer system. Important point to note that for those arriving in Australia part-way through the tax year, the tax-free amount is reduced from $18,200 according to the number of months of residency in the tax year. The tax free threshold will be increased more than threefold, from $6,000 to $18,200, freeing up to one million low-income earners from needing to lodge a tax return from 2012-13. A higher statutory tax free threshold means better interactions with the transfer system and builds on the reforms the Government introduced in the Budget, which mean more cash in people's take home pay from week to week and more immediate and direct returns to work. The LITO will be reduced from $1,500 to $445, with the benefit being reflected in the new tax free threshold. The combined effect of the higher statutory tax free threshold and the LITO is that the effective tax free threshold will rise to $20,542. This means that individuals can earn up to $20,542 from 2012‑13 without paying any net income tax. 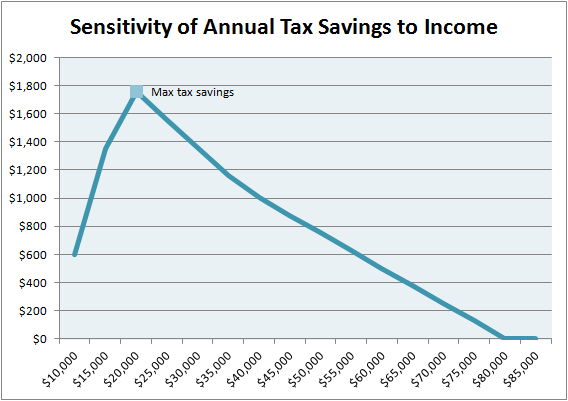 All taxpayers below $80,000 receive a tax cut from 1 July 2012, with most getting a cut of at least $300. This means around 60 per cent of all taxpayers will receive a tax cut of at least $300 and no one will be required to pay more income tax. To see how these new tax rates will affect your salary - use our tax calculator.